Island of Sv. Nikola, June 29 at 8 p.m.
Everyone knows that Germany is not exactly the epitome of soul and funk, but after you hear Mo' Blow you might change your mind. Berliner Zeitung described the quartet as one of the best club bands that grooves as it breaths. Its beginnings go back to 2002 Liverpool, where saxophonist Felix F. Falk went to university. Imbibed with funk, he started a band called Sahnefunk. When he returned to Berlin in 2003, he gathered a group of people who now play as Mo' Blow. In the decade that followed, this dynamic German foursome expanded their materials to include jazz and soul, and gained quite a reputation among clubgoers in a series of tours across Germany, England, Russia, Belgium, Poland, and Denmark. Mo 'Blow also performed at a number of important jazz festivals, including Jazz Festival Kaliningrad in Russia and Jazz Open in Hamburg. In 2008, the band released its first album Funkatristic and won both the jury and the public Berliner Jazz & Blues Award. No wonder, then, that the European ”Master of Funk” Nils Landgren took notice of the young Germans and agreed not only to guest perform on, but also to produce their second album For Those About to Funk, for the prestigious ACT label. Other noted performers on the album were Torsten Goods, Magnus Lindgren, and Magnum Coltrane Price. 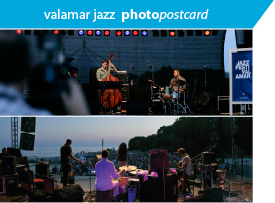 The album received accolades by critics and won the "Future Sounds" competition at the Leverkusen Jazz Days. For this spring, the band has announced its third album Gimme The Boots, also recorded for ACT, which confirms Mo' Blow as an extraordinary combination of the 1970s and contemporary sound. This time, Felix F. Falk, Matti Klein, Tobias Fleischer, and André Seidel have decided to do it all by themselves, even though options for co-operation with other musicians abounded. Save of course for Nils Landgren, who once again could not resist the temptation to produce the album. As an invitation to enjoy this explosive German quartet at the concert in Poreč, this brief note concludes with a quotation from Austrian Kleine Zeitung: ”Mo' Blow is a fantastic, highly energetic, young, top-class band that gave a rousing, hot performance".